As countries in the twentieth and twenty-first centuries change from colonialist to independent rule, or from a socialist to a democratic society, the need for a written constitution becomes apparent. Countries in the former Soviet Union, Africa, or nations once part of the British Empire face social, economic, and humanitarian problems as they experiment with democratic rule. Such issues as clearly defining where sovereignty lies, how much power is given to the people, and what rights are possessed by a nation's citizenry are new to these countries. 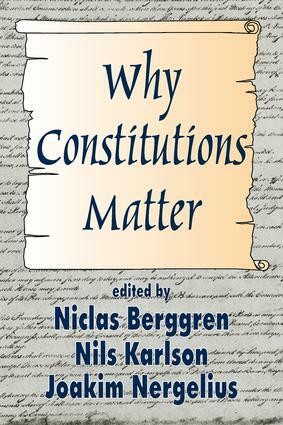 While a constitution, being a man-made document, is subject to interpretation and does not always delineate in a lucid framework its parameters for future generations, it is clear that constitutions do matter.This volume, compiled under the direction of the City University of Stockholm, is an important study on the significance of constitutions and constitutional law in a democratic society. A number of scholars in law, political science, and economics have contributed to this volume. They include: James Buchanan, Aleksander Peczenik, Mats Lundstrom, Joakim Nergelius, Sverker Hard, Niclas Berggren, Peter Kurrild-Klitgaard, Wolfgang Kasper, and Erik Moberg. All add to the understanding of the intertwining roles of politics and the social sciences in a modern democratic state.They explore why a constitution is essential; the relationship between a constitution and a rational political system; the democratic principle of majority rule; why constitutional constraints are needed in a democratic state; recent constitutional reforms in the United Kingdom; the electoral system and its centrality in a democracy; evolution in constitutional change; competition within a federal structure; and the connection between politics and economics. Why Constitutions Matter is a fascinating and timely study of constitutionalism, and will be of interest to students of politics, law, economics, and sociology. IIL Questions and Study Design Theoretical Curiosities or Empirical Relevance?